"Compelling Dan Grzeca print on heavy stock matte paper. 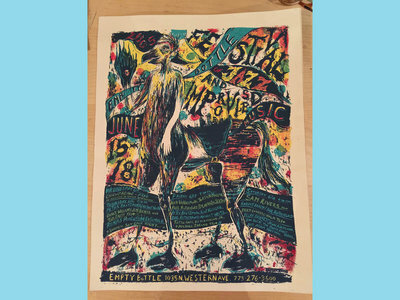 A limited edition made for the 2005 Empty Bottle Festival of Jazz and Improvised Music in Chicago featuring Vandermark, Sam Rivers, Paul Rutherford Brötzmann and many more! Order multiple posters at no extra shipping cost! " "Handprinted letterpress print on heavy stock matte paper. 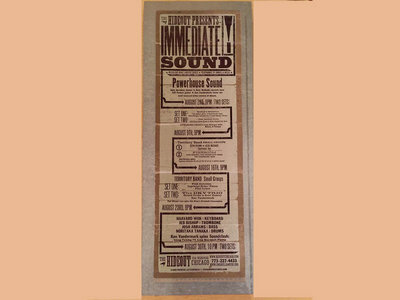 A limited edition made for the Immediate Sound August concert series at the Hideout in Chicago. Order multiple posters at no extra shipping cost! " "A compelling print by Dan Grzeca on heavy stock matte paper. A limited edition of 100 made for the Vandermark 5 two-night Green Mill engagement in 2009. Order multiple posters at no extra shipping cost!" "Beautiful print on heavy stock matte paper. 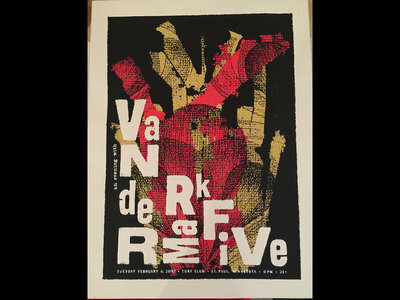 A limited edition made for the Vandermark 5's 2002 engagement at the Turf Club in St. Paul. Order multiple posters at no extra shipping cost"